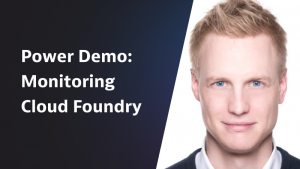 Join this Performance Clinic and hear from Philipp Kastner, Technical Product Manager at Dynatrace, on how you can leverage Dynatrace Synthetic to monitor your key applications, APIs and end user journeys. Philipp will do a hands-on walkthrough showing you how to setup your own Click Paths, HTTP Monitors or how you can use the Dynatrace Synthetic API to automate synthetic test execution into your DevOps Toolchain! Neotys and Dynatrace have teamed up to develop a new integration for efficient continuous testing featuring Jenkins. You will also learn about: How to avoid extra working effort by building more realistic component testing and end-to-end testing? How to take advantage of the AI engine of Dynatrace during each test? In this Performance Clinic session Andreas Grabner, Global Technology Lead at Dynatrace, does a deep dive hands-on on how to configure request attributes, use them for diagnostics, filtering and covers some of the more advanced topics such as custom request naming based on request attributes. In this second episode, Mike Villiger, Sr. Technical Partner Manager, together with Daniela Rabiser, Technical Product Manager will walk us through commonly seen use cases such as understanding how Auctioneers are handling application and task placements on Diego cells. Mike & Daniela will demo the latest product enhancements focusing on Gorouter and Auctioneer platform component metrics. Learn how Ansible’s powerful deployment automation and Dynatrace’s software intelligence can be used together to build auto-remediation workflows and self-healing applications. Automation not only reduces risks and ensures consistent results in dynamic large-scale environments, it also saves you a lot of time you can better use for innovation. Do you know and do you understand the digital experience your customers are having on your digital platforms every day? You know that your customers always compare their digital experience with the ones they are having when using Amazon, AirBnB, Facebook, Uber, etc. In our first AIOps webinar learn how Dynatrace’s next generation AI, Davis, enables truly autonomous cloud operations. During the session we will explain Davis’s deterministic root cause analysis and its power for automating operations in the context of real-world examples. Come join this performance clinic with John Kelly, Sales Engineer at Dynatrace, and see what type of dashboards will enable you to expose maximum business intelligence by understanding and analyzing concepts like Risk Revenue, Lost Revenue and Funnel Weakness. You are running applications on OpenShift or need more insights into the platform? Then our out-of-the-box Kubernetes dashboard is for you which is about to be released and will be featured in the live demo. For app developers and architects we will look into code-level analysis and automatic dependency detection of microservice deployments. Rapid root-cause analysis and increased customer happiness require a unified platform–learn why! In this session Wolfgang Beer, Product Manager at Dynatrace, and Andreas Grabner, Global Technology Lead, will walk you through the enhanced capabilities of the next generation Dynatrace AI root cause analysis and how to feed it with your own data sources. Running apps on Cloud Foundry? Or operating Cloud Foundry? This episode is for you! See our first release of the out-of-the-box Cloud Foundry infrastructure dashboard in action, how Dynatrace auto-detects your microservice dependencies and provides code-level depth. Learn how bringing all your involved parties together to work with one solution drastically increases customer satisfaction and reduces mean time to repair. In this session Jürgen Etzlstorfer, Technology Strategist at Dynatrace, and Andreas Grabner, Global Technology Lead, will walk you through advanced use cases of leveraging deployment automation with Ansible and Dynatrace such as: Automatic Deployment of Dynatrace OneAgents to enable “Monitoring as a Service”; automatically pushing deployment context to Dynatrace’s AI for better Root Cause Analysis; Automate Remediation Workflows to enable self-healing applications and more. Dynatrace provides out-of-the-box Fullstack monitoring of your AWS stack through our OneAgent (EC2, ECS, BeanStalk, …), OneAgent PaaS (Fargate, Lambda …), CloudWatch Metrics (RDS, ALBs, NLB, DynamoDB, …) as well as Log Analytics through OneAgent, CloudTrail & S3. In this advanced monitoring session Andreas Grabner, Global Technology Lead for AWS, does a deep dive hands-on on how to automate the rollout of Dynatrace, how to feed additional data from CloudWatch, how to efficiently leverage Log Analytics and how to enable No-Touch Container Monitoring! In this session, Roman Spitzbart, Senior Director Sales Engineering EMEA at Dynatrace will show you that Dynatrace is your single pane of glass, its fully automated approach will help you to keep up with the complexity and the AI delivers answers instead of just more data - so you can spend more time innovating, not troubleshooting.